SEOUL, Jan. 3 (Yonhap) -- South Korea's Air Force said Tuesday it tapped three female pilots as vice commanders of operational squadrons, marking a first for the service. Last month, the three were promoted as the second-in-command of three fighter squadrons, an Air Force spokesman said. 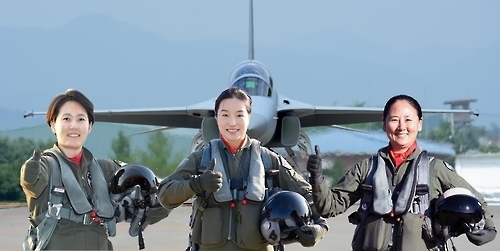 They are Maj. Park Ji-yeon, 38, from the 16th Fighter Wing; Maj. Park Ji-won, 38, from the 8th Fighter Wing; and Maj. Ha Jeong-mi, 37, from the 20th Fighter Wing, the statement said. The main duty of vice commander is to supervise all aviation operations and to educate and train junior pilots, it said. The promotion represents a growing role of female soldiers and officers in South Korea's 630,000-strong military. Woman was first allowed to attend the Air Force Academy in 1997 and the first female fighter was commissioned in 2002.